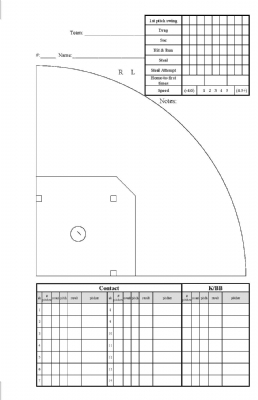 Pocket Spray Hitting Chart - Introduced at the request of coaches looking for a simple tool to instantaneously track your teams’ hitting performance during the game using a spray chart techniue. The Pocket Spray Hitting Chart is a compact 5.5 inches by 8.5 inches and folds easily in half to fit into a coach’s pocket. It is produced on heavy stock paper similar to our dugout charts for ease of writing. The Pocket Spray Hitting Chart comes pre-packaged for 50 games. NEW FEATURE: YOU CAN NOW "CUSTOMIZE" YOUR CARDS WITH YOUR TEAM NAME AND/OR LOGO AND HAVE THEM PRINTED IN COLOR!